The horrific scenes coming out of Syria should not obscure the view. And condemnation and denunciation expressions need not blur reading. Imagine a journalist spending a week contacting officials on countries neighboring Syria, and then supplementing his findings with interviews with concerned parties. -- The Syria crisis is deep, multifaceted and complex. In its first facet, it is an Arab Spring station-stop, i.e. a protest movement against one-party rule that is protected by an iron-fisted grip on security. 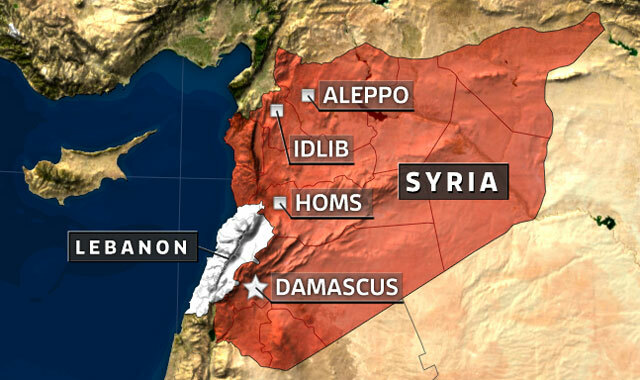 In its second facet, it is a battle over Syria’s location in the region, with some tackling Syria as the frontline of Iran’s open-ended offensive. In its third facet, it is an international tug-of-war in which Russia tries to regain its regional status and block the Arab Spring from creeping to its backyard. -- The Syria crisis dealt a body blow to the regime, hurting it badly. A year ago Syria was a key regional player buttressed by a sternly stable home front and by “cards” it could play beyond its borders. Today, it is a pitch for bitter infighting, thus prone to be wheedled. Its Arab League seat is vacant. Holes have been blown in the clout of its (military and security) services. Its ability to recover its firm stability is very much in doubt. -- In the two weeks after the (mid-March 2011) spark in Deraa, the Syria regime missed the opportunity to scrap Article 8 (of the constitution), set up a national unity government under a consensus prime minister outside of the ruling (Baath) party, and deaden the crave of the security services. Had this been done, protests demanding reform of the regime would not have turned into demonstrations to bring it down. -- Had it not been for the Russian – not Iranian -- lifeboat, the regime would have gone under. Moscow, for strategic reasons, risked standing up to the Arab-Western camp and won the master key to the solution. This does not mean Moscow and Damascus will necessarily remain on the same wavelength. Moreover, the regime that has already cashed in on its alliance with Iran is now paying the tax due on the partnership. -- The regime miscalculated the Arab Spring fallouts. It also underestimated the implications of the region’s Sunnite-Shiite strains. -- The regime succeeded in preventing the emergence of a Syrian Benghazi and in massing “million-strong” rallies. But its violent repression of protests lost it the television war as well as Arab, Muslim and Western public opinion. -- The regime succeeded in convincing nation states, organizations and minority groups that its fall by way of foreign intervention would expose Syria to Iraqi-zation, Afghani-zation, or Somali-zation -- meaning blood-soaked chaos in the heart of the Arab world and on the fringes of Israel. -- The regime was able to retain a degree of popular support massed around a very cohesive military and security machine despite defections that got nowhere near its backbone. -- The regime was able to deal devastating blows to a number of cities, neighborhoods and areas, but failed to quash the protests or table a credible blueprint for ending the crisis. The way out can only be through the redistribution of power together with “command and control” of the components. Some suggest a Syrian “Taif Agreement” such as Lebanon’s. -- The opposition failed over the year to topple the regime while the latter could not stifle the opposition’s resolve to protest amidst the rubble. The opposition succeeded in mustering wide Arab and international backing, but the lack of appetite for military intervention crippled the roles of external players and some neighbors, chiefly Turkey. The opposition proved it could wage an attrition war to burden the regime but was unable to formulate a unified outlook to reassure fretful sides at home and abroad. The regime in turn proved it could sustain a long struggle in spite of international pressure and a quickening economic meltdown. This “profit and loss statement” for the year probably explains the five ground rules agreed by Russian Foreign Minister Sergei Lavrov and the Arab League foreign ministers. The P&L statement might make clear the power balance undoubtedly affecting Kofi Annan’s mission: an opposition unable so far to topple the regime and a regime unable as yet to root out the opposition and a regime that can’t rescind its actions and an opposition that can’t renounce its sacrifices. The picture on the eve of the first anniversary of the Syria crisis is of an internal deadlock, a severe regional test and an international tug. This is unlike any of the previous Arab Spring trials and tribulations.